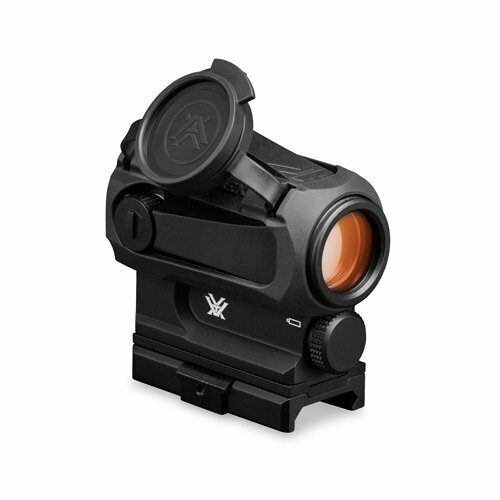 Vortex SPARC AR Waterproof Red Dot Sights provide precision, consistency and speedy target acquisition every time. These compact from Vortex have intuitive, rear facing controls for easy access to and instant visibility of adjustments to power and dot brightness. Save battery life with the automatic shut off feature, then automatically return to the last used intensity level when you turn the Vortex SPARC AR Lightweight Red Dot Sight back on. Waterproof, fogproof and shockproof, the Vortex SPARC AR Tactical Red Dot Sight will be your go-to optic for every situation and every rifle. The Sparc AR sight features a 2 MOA daylight bright red dot that is quick to spot and paints your target regardless of lighting conditions or background. The dot returns to the last intensity used when powered up. Rear-facing controls offer quick access and are viewable from the shooting position. Waterproof, fogproof, and shockproof the anodized, aircraft-grade aluminum body is rubber armored and built to handle the most extreme conditions. The sight operates using a AAA battery and offers up to 300 hours of power at max brightness. After 12 hours, an automatic shutoff prevents accidental battery rundown.